Chef Nicholas didn’t always know he wanted to be in the food industry. 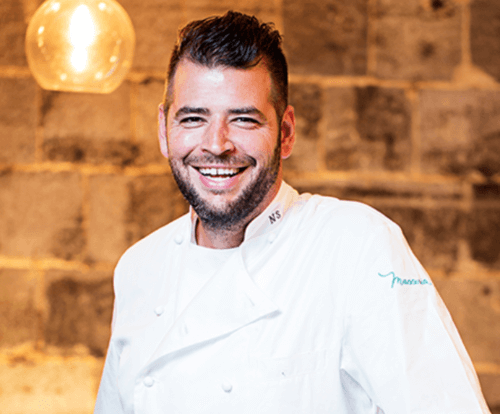 However, his Greek and Italian heritage, attention to detail, and desire for European food culture to be cultivated to the booming DC food scene was the perfect harmony to get Chef Nicholas Stefanelli exactly where he is today. We had a chance to catch up with Nicholas in what he calls “the best seat in the house”: A large booth tucked back in the corner on the second-floor of his Wharf establishment – Officina. 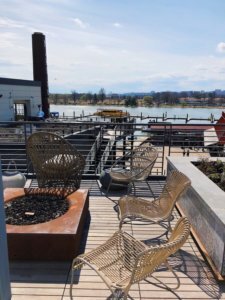 “Tucked back in the corner” comprises of panoramic views of everything this location and restaurant has to offer—the Potomac glistening, the open-air fish market bustling, and his open-kitchen concept working seamlessly. Officina is the flawless culmination of the Italian atmosphere Nicholas wanted to emulate. Nicholas grew up not far in Beltsville, Maryland and attended DeMatha Catholic High School. He imagined himself pursuing fashion, but a trip to Italy in 1999 planted the seed for a food metropolis back home. At the time, DC was hardly the food destination it is today. He enjoyed the cultural lifestyle of Italians—hanging out and enjoying life at bars, cafes, trattorias, and wanted to be a part of bringing that movement here. The timing was serendipitous. At the same time Nicholas began at L’Academie de Cuisine, there was an explosion of food movements in DC. Think: organic, farmer’s markets, consumers wanting more from restaurants, and restaurants giving more. He worked for Roberto Donna at Laboratorio (closed) for two years, then Maestro at the Ritz Tysons (now closed) for 6 years before moving out to the west. He worked in Yountville, California at French Laundry then moved to New York for the reopening of Fiamma (now closed) with Fabio Trabocchi. He returned to the DC-area and met Ashok Bajaj. and help to open Bibiana and stay there for five years. Chef Nick regards Ashok as “a great mentor and teacher.” In August of 2015, Masseria opened and Officina soon following in 2018. His newest project, a Greek restaurant, is set to open this year. Officina is interwoven with unique Italian culinary concepts. The first floor has an all-day Café and Mercato. The Mercato is fully stocked with an abundance of Italian wines, fresh pastas, specialty cheeses and meats, and fresh baked goods. 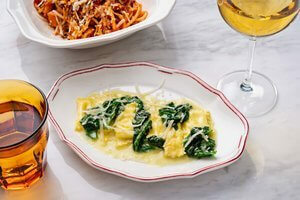 Chef Steffanelli wanted to “bring restaurant quality ingredients that restaurants have access to, to people who usually don’t.” A few steps up from the Mercato is the all-day café, featuring house made pastries and a traditional espresso bar. The menu changes in the afternoon for an aperitivo (happy hour) with complimentary food and discounted drinks. Walk up the modern staircase, past the extensive glass case filled with illustrious wine, and you’ll be greeted with cozy Salotto and the open concept trattoria. The Salotto is home to DC’s only Amaro library with an extensive collection of vintage and new Amari. 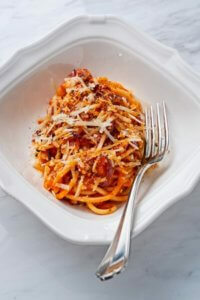 The trattoria boasts homemade pastas, high quality meats and fish, and fresh produce. The menu is written to balance, so there is something for everybody; built to share, experience, and tell the story of Italy’s culture. Officina was curated to illustrate food that is rooted in history. Chef Nicholas wants to tell the stories of each region, while staying true to what the ingredients are and their freshness. He says, “We always want to have the best ingredients on hand, which is why we use Keany Produce.” Additionally, chef accredits Officina’s success and uniqueness from the people that are behind the food. He says the kitchen’s philosophy is to start with the best ingredients, have great people cook it and show respect to it. He wants a team that is dedicated and passionate about cooking. He is constantly training, fine-tuning, and refining his team. For example, the staff often has wine tasting classes. The most rewarding part about being a chef is “to make people happy” says Chef Nicholas. A restaurant is able to provide experiences and share milestones with its guests. Chef Nicholas is excited for spring and summer to begin. Not only does that mean more product options, especially in terms of local offerings, but the restaurant takes on a new life with great weather. It boasts incredible outdoor dining options off the second floor, and an expansive terrace and bar on the third floor. Springtime also means chef can partake in some of his favorite activities—biking and traveling. The Wharf is the perfect location for a quick 4.5-mile ride around the Potomac. He already has a trip planned for Greece in April. 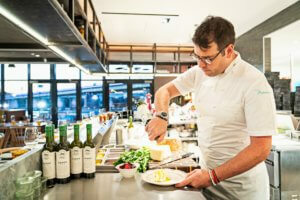 His trip will conclude his final menu preparations for his Greek restaurant set to open this year. Chef Nicholas saw this new concept as a great opportunity to expand because of the Italian and Greek food similarities, but also all of the diversity there is to incorporate. The style will be similar to Officina by remaining true to food rooted in history and regional influences. 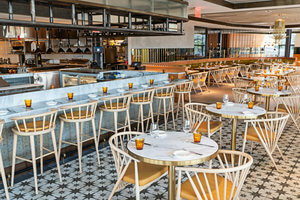 The restaurant will be situated in an iconic DC building that Stefanelli halls as “a leading piece of architecture for DC that is pushing the evolution of where we are going towards.” This historic property is the old Washington Post building, where both Stefanelli’s father and uncle worked for many years. As if Chef Nicholas wasn’t already busy, Masseria, his first location awarded with Michelin stars three years in a row, is planning to have a new tasting menu as a tribute to all the old DC chefs who were pivotal in developing the nation’s capital’s food scene. It will include dishes from chefs: Jean-Louis Palladin, Michel Richard, Gerard Pengaud, Roberto Donna, Yannick Cam, Francois Dinot, Nora Pouillon . They will feature each chef’s signature dish that Stefanelli would either have loved to eat from them or he has learned from them. For instance, Jean-Louis’s dish will be sweetbreads with black truffles. The menu is set to run from March 28 to the end of May. Chef Nicholas has many accolades. His most recent being a nomination by the Restaurant Association of Metro-Washington (RAMW) for Chef of the Year. He has also been nominated for Rising Star by the James Beard Foundation. Masseria was awarded with Best Fine Dining Restaurant by RAMW in 2018.